GDX - Will you Buy This Hated Stock with Me? You’ll have to buy the single most hated asset class on the planet today. Since 2011 gold has plunged 35%. Even worse, gold stocks have cratered 70% in the past seven years. Investors have completely given up on gold and gold miners. 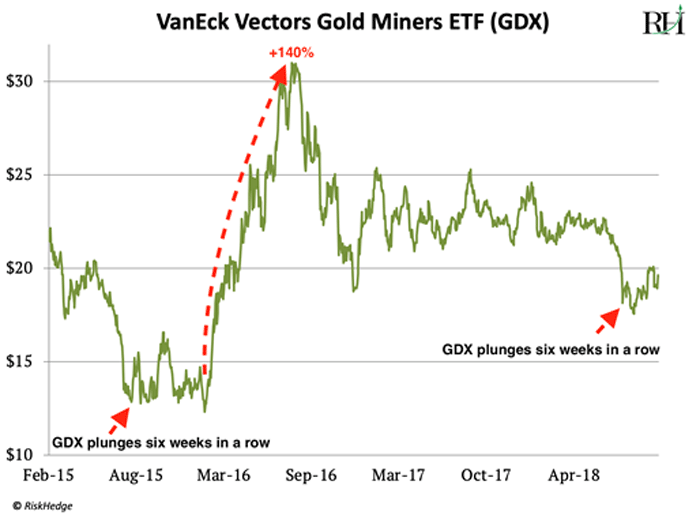 The VanEck Gold Miners ETF (GDX), which tracks the performance of gold stocks, recently suffered a losing streak where it closed lower for six weeks in a row. That almost never happens. If fact, going back to the creation of GDX in 2006, it has only happened twice. The last time was in late 2015. I’ve marked it in the chart below. Today, just like in 2015, GDX has entered a state of exhaustion. Finance nerds use the word exhaustion to describe an investment that’s been subject to relentless selling pressure. Because there’s no one left to sell, exhaustion often signals that a stock has put in a bottom and is ready to march higher. GDX has entered a state of exhaustion for the first time since 2015. And after months of sharp drops, it’s finally perking up. It recently jumped 6% in a single week… one of its best stretches since its 140% surge in 2016. Now when I say gold mining stocks are hated, I mean HATED. Six straight weeks of losses in GDX is just one data point that shows investors want nothing to do with gold stocks. According to the Commitment of Traders report, last month professional traders were “short” gold more than any time in last 17 years… since 2001! As you may know, 2001 marked the beginning of the last great gold bull market that saw gold soar 630% in a decade. The 2001 bottom also kickstarted a 1,350% surge in gold stocks. Here’s another telling statistic. Since the beginning of 2018 investors have yanked $3.5 billion from gold-related ETFs. That’s the highest level of withdrawals in five years. It’s no exaggeration to say gold stocks have NEVER been as hated as they are today. This extreme hatred tells me buying gold miners now is a smart move. It’s never easy to go against the crowd and buy a hated asset. You’ll probably feel uneasy hitting the “buy” button. But as regular RiskHedge readers know, buying hated stocks is one of the lowest risk ways to make big profits in markets. In fact, the last “hated” stock I recommended to you was 3D printing company Stratasys. It has leapt 25% in the last week thanks to better than expected earnings. Self-driving cars, DNA mapping, and the coming superfast 5G cell phone network are much “sexier” than gold mining stocks. But please, don’t let that stop you from taking this opportunity seriously. Gold miners are perhaps the most explosive group of stocks on the planet. Gold stocks have exploded for triple- or quadruple-digit gains seven times in the past 48 years. Buying gold stocks at the correct time is one of the few legitimate strategies for earning big returns quickly in the stock market. It’s also a backdoor way to profit from one of the most insidious disruptions to your finances: the slow death of the US dollar. I won’t get into the whole case for gold here. If you’ve paid a medical or tuition bill recently, you know a dollar doesn’t go far these days. And if you’re familiar with how our financial system works, you know our money isn’t tied to anything of real value anymore. Rather, the value of the dollar largely depends on politicians making responsible financial decisions. By the US government’s own calculations, a dollar is worth 86% less than it was 50 years ago. Think of gold as the reciprocal of the US dollar. Although it goes through short-term price swings, it has held its value for thousands of years. Gold miners are a supercharged version of gold. Even a modest move in gold can slingshot gold stocks much higher. As I mentioned earlier, when gold jumped 30% in early 2016, GDX shot up 140%. I’m buying GDX here. My research shows we could double our money or better in the next few months. Will you join me and buy GDX? If not, why not? Tell me at stephen@riskhedge.com. This article originally appeared on RiskHedge.